The 10th Annual NSW Major Projects Conference was held on the 21st and 22nd November at the ICC – Sydney International Convention Centre. Featuring some of the state’s largest and most influential infrastructure projects, the event brought together over 200 attendees and 29 speakers, proving once again to be a resounding success. With multiple networking opportunities, new and returning speakers, keynote presentations and one very insightful panel discussion, the two-day event shed new understanding on upcoming and established major projects. Opening up Day One was Jim Betts, Chief Executive Officer of Infrastructure NSW, providing delegates with an honest and informative look at the state of NSW’s current and upcoming infrastructure plans and its position in shaping the growth of future generations. Following Betts was Graham Millett, CEO of the Western Sydney Airport, who delivered a presentation addressing the long-term aviation capacity in the Sydney Basin, which will bring new employment and education opportunities and ultimately contribute to Western Sydney’s socio-economic prosperity. In a complementary presentation CEO of Liverpool City Council, Kiersten Fishburn, discussed the plethora of prospects the Western Sydney Airport will create in the region of Liverpool. Boosting development in the area, Liverpool City Council is on a journey to create a higher quality of life for its citizens. Tim Poole, Program Director for the Parramatta Light Rail returned to provide a project update, discussing the rising anticipation surrounding the commencement of early works and the approval of the final business case for Stage 2. A key focus for the state government is to unlock the potential of regional suburbs through increased services and support options. The NSW framework for regional economic development has identified three core objectives; amenity, growth and potential. Chris Hanger, Executive Director, Regional Policy of Infrastructure Programs spoke to the ambition of the Regional Growth Fund and its position to activate regional projects. Debating the utilisation of urban planning in order to better accommodate state-wide growth, Matt Coetzee moderated a panel discussion consisting of Dr Jennifer Kent, Post-Doctoral Research Fellow of Urban and Regional Planning at the University of Sydney, Philip Vivian, Director at Bates Smart and Steve Mann, Chief Executive Officer of the Urban Development Institute of Australia – NSW. The panel of four explored the collaboration that needs to occur between varying sectors to ensure an efficient, effective and sustainable planning process. Day Two once again began with a 30-minute networking event in the conference room which invited speakers, delegates and exhibitors to connect and forge new relationships, building new connections on the foundation of NSW based major projects as a common interest. Helen O’Loughlin, Social Commissioner for the Greater Sydney Commission addressed the impact of infrastructure on the city’s social ecosystem. O’Loughlin pointed out that one of Greater Sydney’s largest challenges to overcome is that its major economic drivers have generally been located along the eastern edge of New South Wales. Craig Limkin, Executive Director of Create Infrastructure for the Department of Planning and Environment acknowledged Sydney’s potential as an influencer of cultural and creative growth. The NSW Cultural Infrastructure Plan 2025+, put forth by the state government, aims to elevate involvement and development across the industry. A/Chief Executive for Sydney Metro, Tom Gellibrand, returned to deliver a 20-minute presentation on the topic of Sydney’s Largest Public Transport Project. Totalling $20 billion worth of infrastructure investments the works from Chatswood to Bankstown are due to be completed by 2024. The 10th Annual NSW Major Projects Conference 2018 proved to be a grand success with keynote presentations, multiple networking events and a delightful cocktail networking function at the conclusion of Day One. 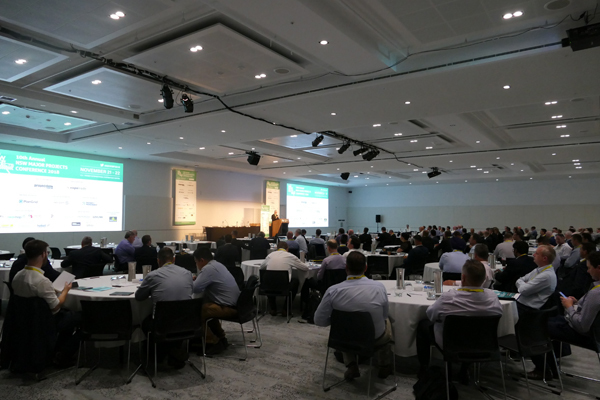 The two-day event held on the 21st & 22nd of November at the ICC – Sydney International Convention Centre brought together industry experts from all levels to provide an informative and well-rounded view of NSW major projects. Expotrade is a global conference and event organizer with its head office based in Melbourne, Australia. Expotrade has delivered some of the largest, most successful B2B industry conferences and events in the areas of infrastructure, major projects, sustainability, technology & architecture. For over 10 years, our unique blend of knowledge, experience and flexibility has accomplished an array of consistently top-quality events. Today, Expotrade events enjoy such a distinctive edge, they are amongst the best patronised in the calendar.